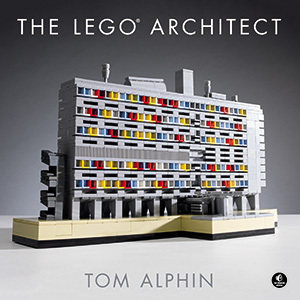 Looking for an inexpensive gift for someone who loves LEGO or Architecture? Please consider my bestselling book, The LEGO Architect. It explores 7 architectural styles, featuring amazing LEGO models, inspiration photos of real buildings, a brief history, and instructions to build 12 models using common bricks you already have. In 2008, LEGO introduced a dedicated “Architecture” product line aimed at appealing to a more mature audience. These sets are a little different from your everyday set: They come in a thick premium box with distinctive black packaging, and the instruction manuals are better too: they are small softcover books with many pages dedicated to architect, design process and history of each building. These are premium sets targeted at adults who grew up playing with LEGO, but most of them are only a little more expensive than a mainstream LEGO set. What makes a great set? I tried to quantify each set on a variety of metrics ranging from value, quality of completed model, advanced building techniques, inclusion of interesting parts. This helped me identify the sets which stood out to me as excellent, and I have explained what makes them stand out. I also called out the models which make great “puzzle builds”, in that you can complete the model using only the photo on the front of the box. All five of these sets are excellent, so you should feel comfortable buying whichever set is most appealing to you. No other set in the series so perfectly evokes a famous world landmark using so few pieces. This model is a poster child for efficiency; it is built out of just 57 bricks, the least parts of any set in the series. This does result in a high price per part, although in fairness, many of the parts included in the set are large or obscure parts. I should note that this model does require you to cut three parts to the right length. This felt like a very un-LEGO thing to do, so I recommend that you do it quickly and carefully, and forget that it happened. This is a pretty fun model to try and build using only the photo on the front of the box. It is not as easy as something more rectangular like the Empire State Building, but it should be pretty easy for most experienced LEGO builders to complete. It makes a great model to display on your desk as most people don’t immediately recognize that it is built of LEGO. The Space Needle is a great small set which I recommend for it’s elegant finished look. Buy it at Lego.com or Amazon.com. If you are looking for a simple model or a less expensive set, look no further than the Empire State Building. This model does a great job of capturing the overall shape of this classic New York City skyscraper in just 77 pieces. It is a pretty straightforward model to build without using the directions, so I encourage that you try this way of building, you may never want to use the instructions again! It is worth nothing that the Sears Tower (recently renamed Willis Tower) is a similarly excellent small LEGO Skyscraper, but I think the Empire State Building is a slightly more recognizable model, and the Sears Tower set has been discontinued. This is one of the better looking models in the series, and with a price less than 10 cents per part, it is a good value as well. I really liked that this model includes several good examples of SNOT construction, where bricks are assembled such that the Studs are Not On the Top. I thoroughly enjoyed building this model without using the directions, although it was a good challenge. It took me a couple hours to build, and I only made a few minor mistakes since I couldn’t see exactly how the roof was assembled, and I only used the photo on the front of the box, so I had to guess about the back corner of the model. Big Ben is the perfect mid-sized set for someone who has built a smaller model like the Empire State Building, but doesn’t want to spend 50$ for the White House or try to build a model as complex as the UN Headquarters yet. Big Ben is a great mid-sized set, and a good value. Buy it at Lego.com or Amazon.com. This set is more than just one building, it captures a collection of buildings in a beautiful scene. The UN Headquarters is an exceptional model in the series, as it employs the most advanced building techniques of all the sets in this price range. This results in the most detailed small model in the whole series. I can’t say enough good things about this model. It beautifully captures a famous world landmark, and employs some nice building techniques along the way. I like that the model uses some advanced building techniques for the windows and the columns. I love that the model is unapologetically LEGO in it’s design, with visible studs on the grass, chimneys and the cute blocky trees. For me, the set also represents the hardest model in the series which you can practically build without using the directions. I did allow myself to use the photo on the back of the box, since the White House has a curved back porch. It took me many days to build, although I just worked on it for a few minutes at a time. I hope that you found this article useful, and are inspired to give a model in the Architecture series a try! If you are interested in Architecture but would rather build your own models, check out my 30-day challenge based on the excellent Lego Architecture Studio set. What do you think? Do you agree with this list, or did I miss your favorite model? Tell me your favorite Architecture model by leaving a comment below. I own 4 of the 5 sets and in summary 13 of the arch sets. The difference might come from my origin, i am from germany.